These two photos show the differences between the Non-AI, AI and AIS Nikon mounts. 1. The "nostrils" in the fork on the AI and AIS lenses; it's solid on the Non-AI. 2. 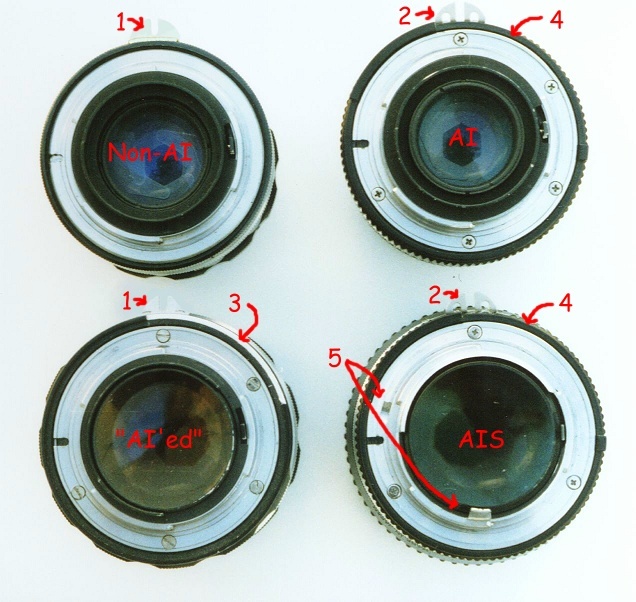 On the AI and Non-AI, the aperture number 16 (the smallest on the lens) is painted blue. On AIS lenses, the smallest aperture number is always painted orange as at (3). Here is a back view of four Nikkor lenses. 1. The two on the left both have the solid fork of a Non-AI lens. 2. The AI and AIS lenses at the right have the "nostrils" in the fork. 3. The lens at lower left has been converted to "AI" specification by milling the back edge of the aperture ring, creating the ledge necessary to mate with the AI ring on the camera body. 4. On the AI and AIS lenses, the ridge is part of the design of the aperture ring. 5. The difference between the AI and AIS lenses is the milled slot at the left and the fixed tab at the bottom on the AIS. Non-AI lenses fit on the Nikon F, early F2, Nikkormat FT, FTN, FT2, EL and ELW, and the Nikkorex F. They can be used without meter coupling on the earliest AI camera bodies such as the FM and FE, but they MUST NOT be mounted on later ones such as the FM2, as it is possible to damage the camera body. AI lenses fit all of these, plus the Nikkormat FT3, Nikon EL2, FM, FE, Fm2, FE2, later F2, F3, EM, FG20 and all later manual focus Nikons that do NOT feature program or shutter-priority exposure automation. They can be used on program cameras in manual and aperture-priority modes. AIS lenses support program operation in the FA and FG models, in addition to fitting all earlier models listed above. There. I THINK I've got that all correct. If you detect any misstatements, let me know and I'll fix it. 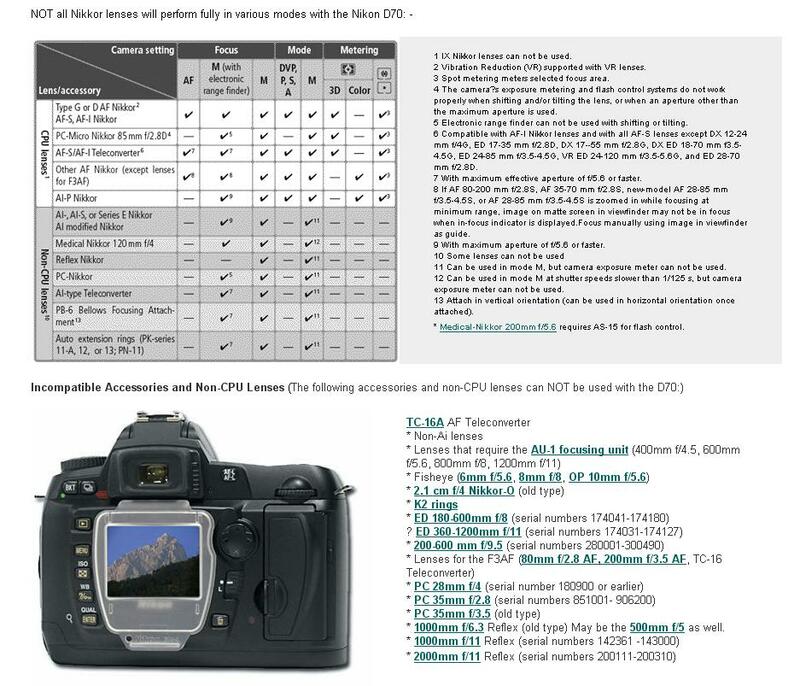 The question of compatibility of ANY of the above with Nikon Digital SLRs is too complex and confusing to discuss. Instead, I have linked below a chart showing the various degrees of self-incompatibility "designed" into the Nikon lens "system". I lifted this from Leo Foo's excellent site at mir.com.my, but now I can't find its original location any more (Sorry, Leo!). In any case, click the link below for that information.